The difference between RF admittance and RF capacitance level sensor technology is the obvious, one senses the presence of the target material by detecting a change in admittance, the other by a change in capacitance in an internal circuit. Either way, they both work essential the same. RF admittance technology in level sensors can be implemented as a point level sensor and as a continuous level sensor. In the point level sensor an on/off switch output is provided to indicate either material presence detection or material absence. The output cycles open-close or close-open based upon a change in admittance or capacitance in a circuit. The admittance/capacitance of the circuit is measured in air (no material) and with material present. The difference in capacitance measured can be slight at times, but this is dependent on the dielectric constant (a.k.a. relative permittivity) of the target material. When using RF admittance or RF capacitance technology for continuous level measurement the level transmitter measures the total capacitance or admittance in a circuit as it changes in relation to the amount of target material surrounding the probe length. For a look at an RF admittance point level sensor you can visit our SAL series product page or download the SAL series RF admittance point level sensor sales catalog. 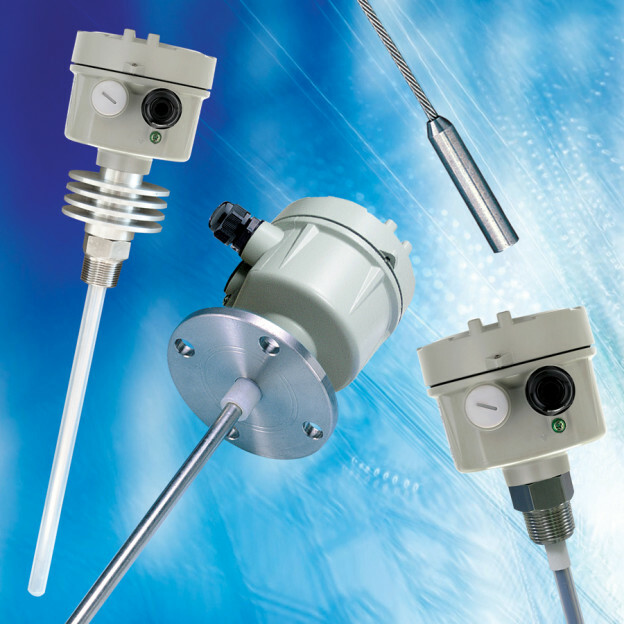 For a look at an RF admittance continuous level transmitter you can visit our EB5 series product page or download the EB series RF admittance level transmitter sales catalog. For more information on the SAL and EB series RF admittance level instruments you can contact us at 815-632-3132.